​Why sit when you can swing? Sitting isn’t an activity that can truthfully be described as being inherently fun. However, there are definitely ways to make sitting more fun – for example sitting on a gem-encrusted golden throne, sitting on an enormous stuffed toy tiger, sitting on a bike whizzing down the city’s steepest hill. Or, more simply, sitting on a chair that moves. It’s possible that swing chairs tap into a childlike yearning for constant motion that most people struggle to find outlets for once they grow too big to acceptably play on a roundabout or ride a rocking horse. It’s possible that, reassuring and sleep-inducing, swaying in a swing chair brings us back to a time when it was our mothers who would sway us off to the land of nod. Or, perhaps more likely, it’s possible that swing chairs are just really cool. Whatever the reason, this style of seating has an appeal that has persevered even as its novelty has diminished. This is an example of one of the more popular styles of swing chairs these days, and with good reason. It’s a very modern piece, and yet its simplicity combined with its traditional basket-like weave means it would fit in well with a wide range of decorative styles, including more classic ones. Because of the texture the light shines through it, making it stand out particularly well against a window, as shown here. As an added bonus, it only has one chain, so this is a chair not only for swinging but for spinning. Children will be irresistibly drawn to it, be warned. Less a swing chair and more an actual swing, this vibrantly-upholstered piece has enough vivacity to imbue even the most staid of rooms with an edge of the unpredictable. 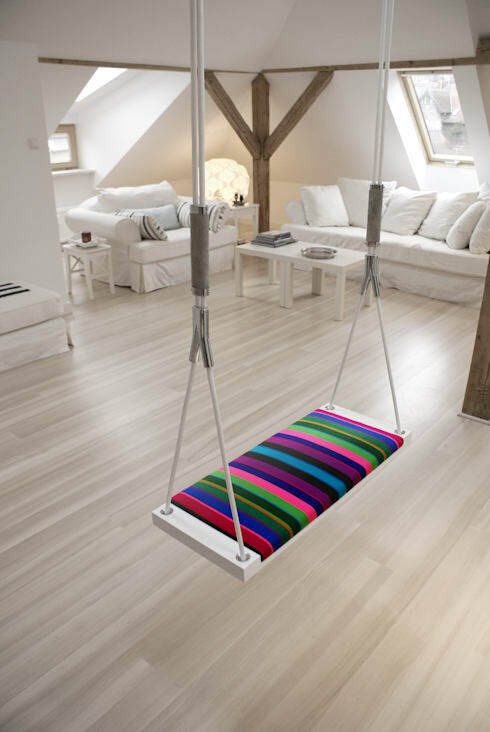 In this case the swing stands out all the more boldly as its surroundings are so conspicuously grown-up. 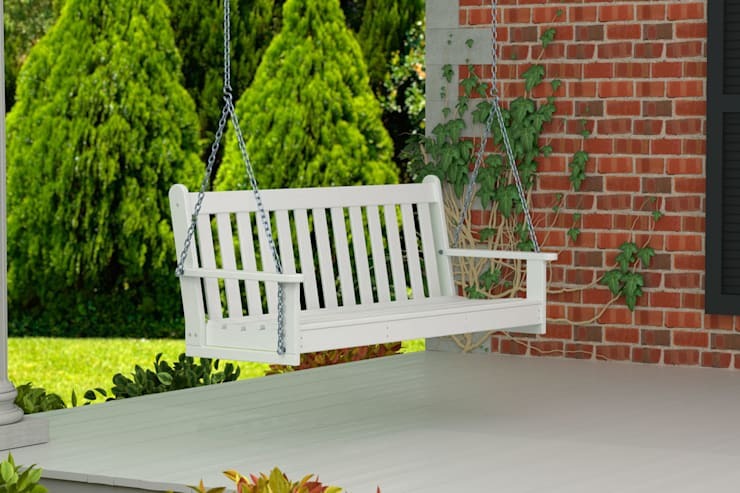 Swing chairs, or perhaps to refer to them more accurately swing benches, were originally a piece of garden furniture and it’s sill in the outdoor domain that they’re most frequently found. This one is a real classic, having all the trappings of a standard bench – except the legs. So many unremarkable parts of the day could be instantly livened up by substituting swings for seats. 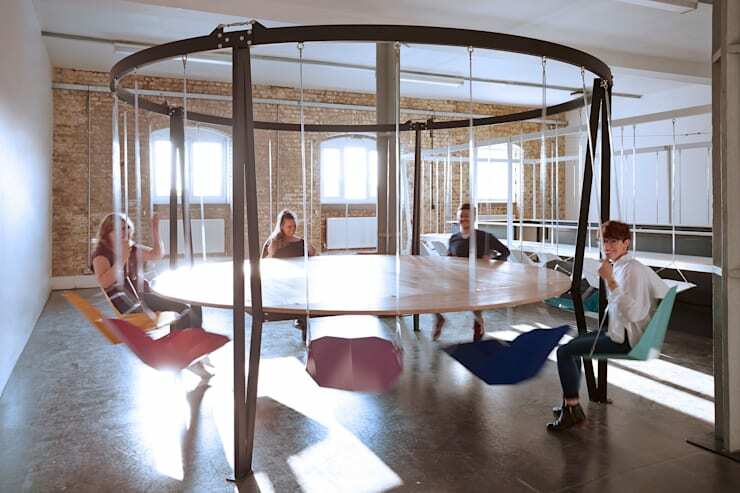 `That weekly all-staff meeting that normally feels like it drags on for days, for example, might suddenly seem like a more appealing prospect if it was held round a table like this one, which comes equipped with 12 colourful swing seats. And what about breakfast? No longer something to be rushed through on the way out the door in the morning, but a lively experience worth relishing. Everything about this design is lighthearted – from the bright rainbow of different colours it includes to the cute origami-like form of the seats themselves. This monochrome variety of the piece above looks distinctly more adult, and rightly so – this one is actually a bar. Adding alcohol into the swing chair experience could be either the best idea or the worst idea ever, but one thing’s for sure – it would make for an unforgettable night out either way. 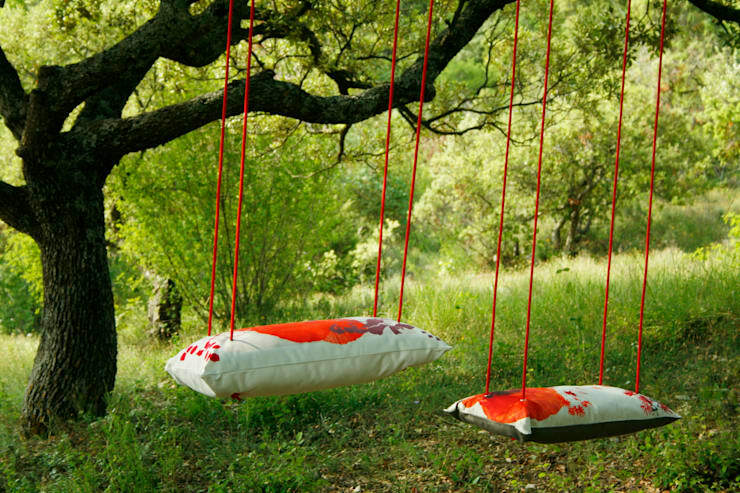 These unique swings are made out of pillows, making them as comfy as they are fun. Their floral pattern makes them perfect for this garden, while their bright red cords contrast beautifully with the surrounding greenery. Which of these designs is your favourite? Let us know!